"Dixie is our solid black Kobetan girl with white tuxedo markings, and she only weighs 14 pounds. Dixie has a very silky coat that at two years old is showing the results of the silvering gene. We won't be surprised if by the time that she is three years old that Dixie has silvered out completely in color. While all three of these Kobetan girls are athletic, Dixie is the most athletic, and she is very good at climbing wire fences." The Kobetan is not a purebred dog. It is a cross between the Cocker Spaniel and the Tibetan Terrier. The best way to determine the temperament of a mixed breed is to look up all breeds in the cross and know you can get any combination of any of the characteristics found in either breed. Not all of these designer hybrid dogs being bred are 50% purebred to 50% purebred. It is very common for breeders to breed multi-generation crosses. 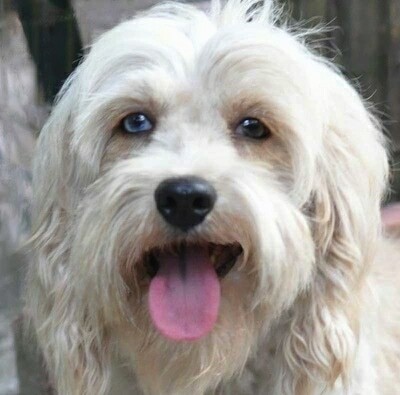 "Pale platinum-colored Mitzi is also a "hidden merle," and she inherited her merle gene from her merle American Cocker sire. And that's where her one bright blue eye came from too. And Mitzi also has very dark "eyeliner" that sets off her eyes very well. Mitzi is our largest Kobetan girl, at 16 pounds." "I have three Kobetan girls—Mitzi, Dixie and Trixi. This is Dixie and Trixi. 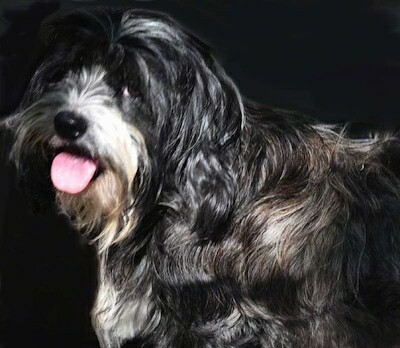 Kobetans are an adorable mix of Tibetan Terrier and American Cocker Spaniel, and this F1 designer mix can be registered with the ACHC. And our particular three Kobetan girls are all rather small at two years old, as their sire is a really small for the breed American Cocker, and their Tibetan Terrier dam is also rather small for her breed. These three girls are just delightful little pets that look a lot like a Tibetan Terrier, but are smaller in size and have a silkier coat, and act more like a Cocker Spaniel." "Our girls have beards and bushy eyebrows, called furnishings, and have continuously growing hair—not fur—and thus they are somewhat hypoallergenic, as they do not create much dander, which is the real allergen from dogs. 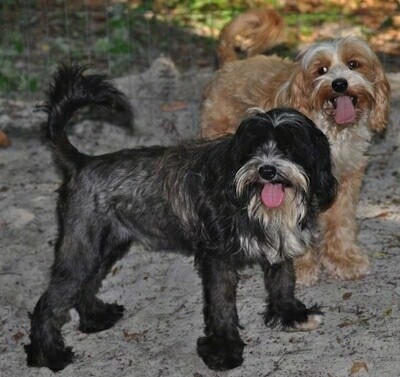 And although they look much more like a smaller sized Tibetan Terrier than a Cocker, our three Kobetan girls have very friendly and perky personalities much like the Cocker." "Trixi is our tiny apricot-colored Kobetan girl, at only 12 pounds. Trixi also has white tuxedo markings. All three of these sisters and littermates get along fairly well together, with just a few tiffs now and then, with each trying to be the boss of the other two. We clip our three Kobetan girls into lion cuts every summer, as we all live in very hot and steamy Florida."